Minimum waved wire NiCr heating element of 400W, mounted on a mica frame that incorporates a self-resetable thermal cut-off which disconnect the whole appliance. The heating element can be disconnected by means of an ON/OFF switch. Adjusted for a minimum power of 420W it consumes an average of 1.8 Watts per drying cycle, which achieves an energy savings of greater than 90% with respect to traditional hand dryers (average consumption of 19-20 Watts/cycle). Adjusted to its maximum power, 1500W, it consumes an average of 4.2 Watts per cycle: these results in an energy savings greater than 80% with respect to traditional dryers (average consumption of 19-20 Watts/cycle). Dries hands in record speed, between 8 and 12 seconds, which is four times faster than traditional dryers and achieves a maximum air outlet speed of 325 Km/ hour. It is estimated that annually the carbon print of a traditional machine an average of 500 Kg of CO2. Using the same annual drying cycles, the Machflow® family consumes an average of 237 Kg of CO2, which represents a 53% annual carbon print reduction. Between 68 and 75 dB. In the fast drying sector, Machflow® is one of the models that produce the least amount of noise pollution. The Machflow® Plug-in technology is an easy, practical, fast and secure system to install and uninstall a hand dryer, making maintenance much more efficient and reducing at the same time its costs. 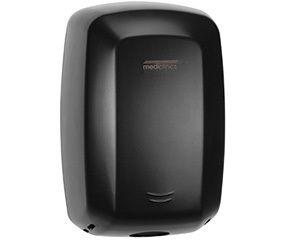 With the Machflow® Plug-in technology a hand dryer can be installed in only three main steps, it can be replaced in less than 10 seconds thanks to its SMED (Single-Minute Exchange of Die) system, its maintenance can be carried out better at the main¬tenance Fast install/uninstall technology to the wall (optional and by means of a special kit code: KTP009). Machflow® hand dryers comply with the most important international quality and safety certifications: GS, EMC, UL, CE, Blue Angel, etc.